In 2013, after nearly two years of field research in Southern California, graduate student Forest Peterson M.S. ’07 couldn’t wait to get home to Stanford. Peterson, a married father of three and current Ph.D. in civil engineering, had visited his family so infrequently that his young children had forgotten who he was, and his pregnant wife had begun to resent him for being away. But according to Peterson, his return to campus did not go smoothly, as he’d anticipated. Within a month of being back at Stanford, he received an email notifying him that he would be unable to renew his housing after six years — a time limit he said he’d overlooked, misunderstanding Stanford’s policies. A single student would have stopped the clock on his housing contract while away, but Peterson, loathe to uproot his family, had continued using the one year of University housing and five years of housing lottery priority that Stanford guarantees to its Ph.D. students. Now, Peterson would need to house a family of five in Silicon Valley on a student’s budget. “I call it being evicted,” he said. Peterson believes his experience with housing — and what he criticizes as the University’s lack of flexibility for his particular circumstances as a student-parent — is part of a bigger problem at Stanford, where the Bay Area’s high costs of living put particular strain on families’ budgets. 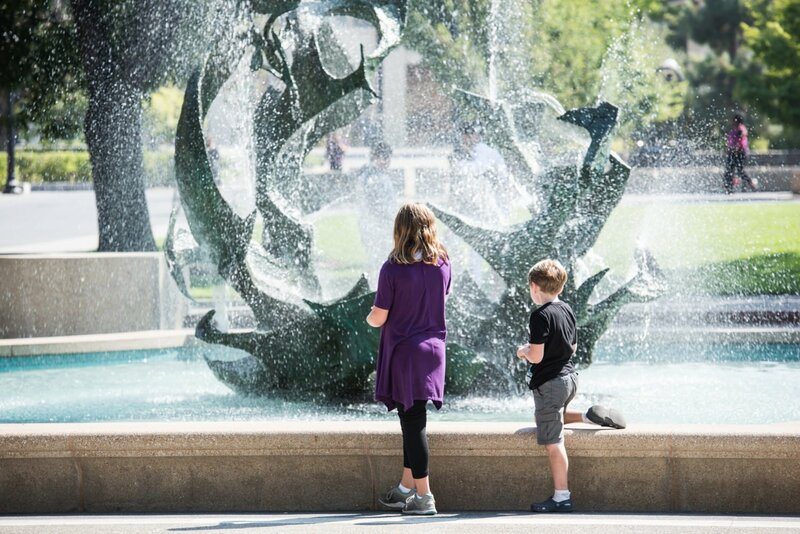 Graduate students with children who spoke to The Daily said that they feel they are being overlooked and that the University could do more to meet their needs. In 2016, Peterson and a group of parents with similar concerns formed the Student Parent Alliance (SPA), an advocacy group that aims to improve Stanford’s resources and accommodations for this special subset of the community. The SPA now has several hundred members, including faculty and administrators. University officials say that Stanford is dedicated to collaborating with the parents to address their concerns. This year, the University formed the Student Family Working Advisory Group (SF-WAG), a specialized task group that has begun working with the SPA on issues such as access to housing, lactation spaces and child care, among several others. Some students questioned if the University is doing enough. 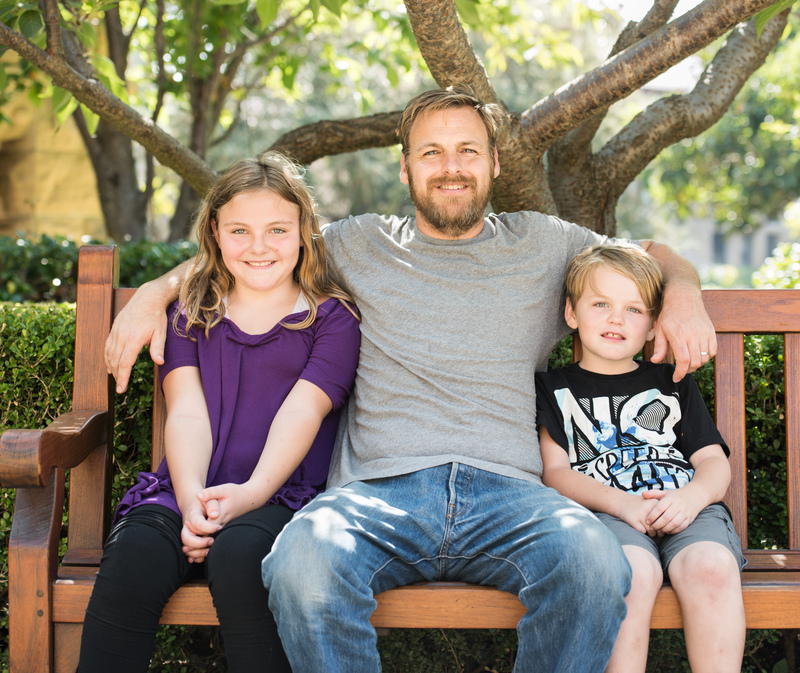 Graduate student Forest Peterson with two of his children (AVERY KRIEGER/The Stanford Daily). Stanford’s graduate housing shortage and an expensive Silicon Valley housing market pose challenges for many students, not just those with children. But difficulties in finding housing may fall especially hard on families, student-parents said. Even for student-parents who do not pursue field research, completing degrees within the time period allotted for housing can be an immense challenge, Peterson said, citing the extra demands of attending school while raising a child. While the University grants Masters students with children an extra year of housing priority, it does not make the same provisions for students pursuing Ph.D.s. Students who lose priority can still enter a housing lottery. According to Breeland, changes to the priority system that began in part last year and kicked in fully this year allowed all students with children who requested on-campus housing — even those without priority years left — to receive it in the housing lottery for 2017-18. R&DE accommodated those who wanted off-campus assignments too, Breeland said. Stanford has housing designed specifically for families in northern Escondido Village, and gives families preference for two-bedrooms in Escondido South, according to Breeland. The housing lottery hasn’t always been able to accommodate all student-parent applicants. Last school year, 13 student-parents who applied for on-campus or subsidized off-campus housing were unassigned in the initial lottery, including the seven who applied without priority or a special medical need. However, those student-parents’ predicament was part of a broader housing crunch affecting all kinds of graduate students, one the University hopes to combat with an Escondido Village construction project expected to add 2,000 beds in 2020. Parents made up just a small portion of the 724 total or 11 percent of students who sought housing but were unassigned that round. Peterson said he did not receive housing when he entered the lottery in 2013 and again the next year. In 2013-14, between 21 and 36 student parents were on a housing wait-list each quarter; about a third got off the list. For Peterson, losing his campus housing meant moving five times in the following years, as a lack of stable income made it hard to secure a long-term living arrangement. Breeland noted that Stanford provides support to students who choose not to live in or aren’t able to get University housing. R&DE compiles off-campus housing listings and other resources, and Housing Assignments staff can advise students one-on-one. The Financial Aid Office awards some graduate students loans of up to $6,000 throughout their Stanford career to help with move-in costs such as a first payment on an apartment. The Bay Area, however, remains expensive. This year, the Mercury News reported that the median rent for a two-bedroom apartment in Palo Alto was $3,600 per month, with down payments typically requiring at least an additional month’s worth of rent. Benjamin Shank Ph.D. ’14, a former graduate student in the physics department whose housing contract also expired, said he was unable to find living arrangements in the Bay Area and sent his family across the country to live with his in-laws in 2012. Shank spent his final year at the University subletting Stanford housing from other graduate students and living in his office. However, Shank would not wish his experience on another family. With the help of a supportive advisor and coworkers, Shank was able to finish his degree and “leave as soon as possible,” he said. Graduate student Tina Cheuk with her daughter (Courtesy of Tina Cheuk). While any student-parent can eventually lose housing, SPA leaders noted extra burdens of pursuing a degree as a mother that they see as emblematic of broader institutional barriers women may face in keeping up with their male counterparts in academia. They pinpointed two examples of resources that Stanford can expand to help mothers: maternity leave and lactation space. The University’s maternity leave policy grants graduate students from teaching assistant or research assistant duties after giving birth. Because fathers and other partners are excluded from the program, the SPA argues, mothers have to make a tough choice: Either take the six weeks and fall behind male colleagues or pass on the leave in order to remain competitive, a decision that student mothers said can have harmful effects on the early stages of a newborn child’s development. One of the SPA’s initiatives, listed on the group’s website, is to expand maternity leave to a general parental leave, thereby leveling the playing field and providing families with more flexibility in deciding how to raise their child. Some student mothers said that childbirth is only the first in a series of challenges they face as they work toward degrees. 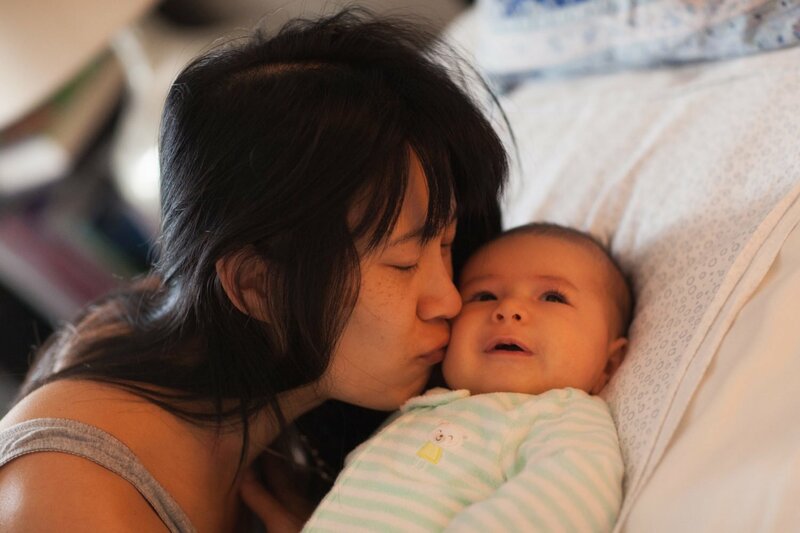 Cheuk, a Ph.D. candidate in the Graduate School of Education (GSE), said she struggled to find a good place to pump her breast milk when she arrived at Stanford in 2014 as the mother of a newborn. Needing to pump milk throughout the day to feed her child when she got home, Cheuk inquired about lactation spaces on campus. She said she expected to find designated spaces in her building for women with the same predicament but was instead directed to bathrooms, cubicles and conference rooms. When she voiced concerns about privacy, she said, people higher up in the GSE told her to hang a “Do Not Disturb” sign and prop a chair against the door to prevent people from entering. The GSE did have one designated lactation space in Cubberley, the education building, Cheuk said. But the distance made it less accessible for Cheuk and other members of her school who spend their time primarily at the Center for Education Research at Stanford. According to Cheuk, the space was also located in an old, dusty basement (“I was surprised there weren’t rat droppings,” she said, half-jokingly). The experience prompted Cheuk to launch what became a two-year effort to improve the quality of lactation spaces in her department, during which she contacted 18 university administrators through email and in-person meetings, she said. Cheuk said she was met with sympathy but made little progress in her goals until 2016, when the University agreed to work with Cheuk to design two new “Wellness Rooms” in her department. Still, she said she and her colleagues have found it difficult to ensure that these rooms are used for their intended purpose. Cheuk has often seen the rooms used by male coworkers as a quiet space to take calls or naps. An April email from Graduate School of Education staff reminded GSE members that the school’s Wellness Rooms are meant for nursing mothers, those feeling ill and people briefly meditating — not for lunch breaks, conference calls and sleeping. According to Priscilla Fiden, associate dean for administration at the GSE, the Wellness Rooms now have signs notifying users that lactating mothers have first priority in all cases. In a survey sent to GSE students last year, 11 mothers reported using the space to lactate regularly. Still, Cheuk feels that the Wellness Rooms are not fully suitable lactation spaces, citing sanitary concerns over pumping breast milk in rooms shared with people that might be sick. She said her frustration over lactation options over the last few years has raised doubts in her mind about her intended career path in academia. “All these issues add up, and as women we have to work that much harder in these systems to be successful,” Cheuk said. Lisa Hummel, a graduate student in sociology and fellow SPA member, voiced similar concerns, arguing that gender imbalances in industries such as tech and academia are often rooted in the institutional barriers new mothers face at universities. Hummel does not have children but said she supports SPA’s initiatives because she realizes the policies it advocates may play a role in her life in the future. Currently, Stanford lists 26 designated lactation spaces on its website, and states that “[a]ny space that is private and is not located in a bathroom can be considered for lactation space use” with permission. According to University spokesperson Ernest Miranda, the University’s Human Resources department has begun drafting a new policy on accommodating lactation and is partnering with campus organizations such as the SPA to ensure a “culture of support for breastfeeding” for the entire Stanford community. The University’s Title IX office also serves as a resource for students with concerns over lactation support, Miranda said. Cheuk no longer needs lactation spaces, but said she is glad her two-year campaign will benefit future students. However, what she describes as the University’s inertia in responding to her complaint has left her feeling — like other members of the SPA — that the University can afford to ignore issues they raise and continue to attract top-tier talent. “Unless they start losing graduate students to other top institutions, it’s not really their problem,” Hummel said. 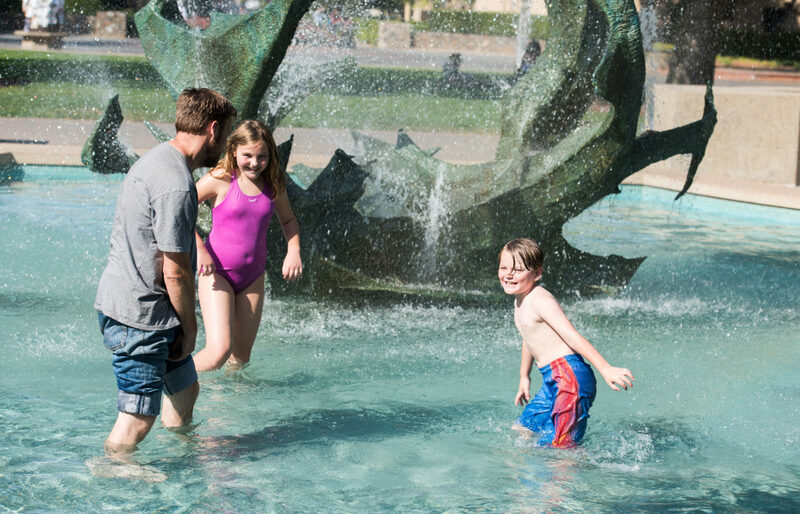 Forest Peterson fountain-hops with his children (AVERY KRIEGER/The Stanford Daily). Access to affordable child care remains a worry for some student parents in addition to housing and lactation space. Last year, the University announced its decision to close Rainbow School and Pepper Tree After School Program, two of the eight child care centers on campus. The programs were the only two at Stanford that granted student-parents the highest priority in enrollment as well as reduced tuition — regardless of income — for residents of Escondido Village, where graduate students are concentrated. The University closed Rainbow and Pepper Tree in order to expand another child care center on campus. Stanford will grant the land opened by the demolition of the schools to Children’s Center of the Stanford Community (CCSC), an independent non-profit program that will grow its enrollment from 144 to 255 children. Stanford is also partnering with the Palo Alto Unified School District to increase the capacity of Palo Alto Community Child Care (PACCC), an after-school program which operates one of its child care facilities at Escondido Elementary School. “In regards to the closures of Rainbow and Pepper Tree, we greatly appreciate the love that exists for these programs, and the decision to close them was not undertaken lightly,” University spokesperson Lisa Lapin said in a statement to The Daily. “We made the decision to maximize the expansion opportunity for CCSC because not only does this bring infant and toddler care into the [Escondido Village] neighborhood, but it also allows us to grow a program that has consistently high demand,” Lapin said. Phyllis Pires, senior director of WorkLife Strategy at Stanford, told The Daily previously that graduate students at centers besides Pepper Tree and Rainbow, where students got top preference, receive priority for child care after faculty. For the first year after Pepper Tree and Rainbow’s closures, families are getting either priority to move to PACC or “additional priority at all of our child care programs to ensure their children can have a continuity of care,” Lapin said. Still, SPA member Hummel, a former child care research specialist at WorkLife, was critical. An email obtained by The Daily from a PACCC administrator stated that the center will not give priority to graduate students beyond children entering the program this year and their siblings in future years. Graduate students get discounts on Stanford’s child care programs based on their income. According to Lapin, about half of the school’s graduate student families currently benefit from tuition reductions of several hundred dollars each month. Only University faculty and staff are eligible for up to $5,000-per-year grants through the Child Care Subsidy Grant Program (CCSG). Without reduced tuition, the cost of child care at a center like CCSC can become prohibitive for some graduate students. During the 2016-2017 school year, the center charged between $1,850 and $2,445 per month for full-time care, depending on the age of the child. 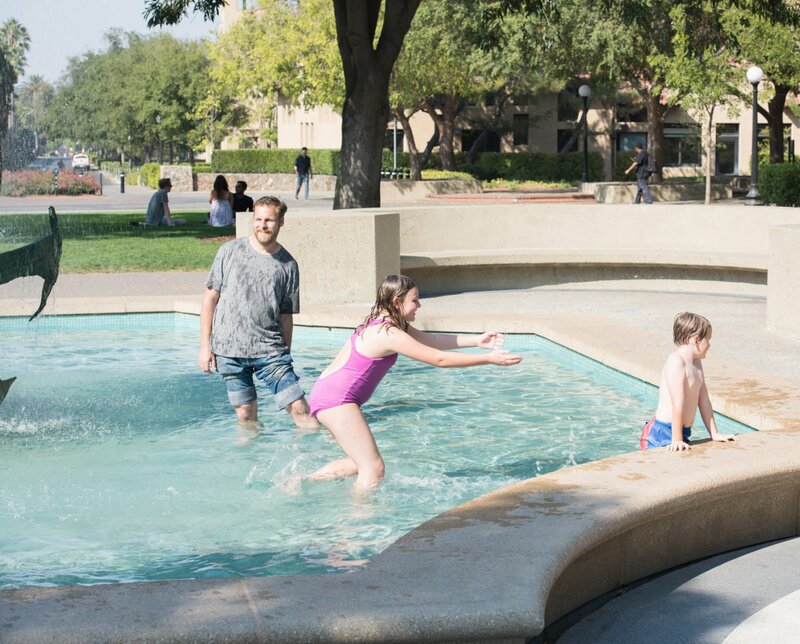 Ericka Weathers, a student in the Graduate School of Education, said her family feels the strain of paying the full cost of tuition for her two children at Stanford Madera Grove Children’s Center. Because her husband has a job, her family falls above the income cutoff for tuition reductions, she said. The SPA’s formation prompted the University this year to assemble SF-WAG, the task group that will work with the organization to address its concerns. Led by Pires from WorkLife Strategy and Ken Hsu, assistant vice provost and director of the Graduate Life Office, SF-WAG met with the SPA in April for the first time. “Stanford is committed to supporting students with children and dependents, recognizing that these students have unique challenges, particularly in Silicon Valley, where housing, health care and child care costs have increased markedly,” Hsu and Pires said in a statement to The Daily. “During [the meeting in April], the participants all agreed that the way to move forward most swiftly — to identify actionable items and to prioritize them — is to establish a collaborative working group whose membership represents the key university offices that share resources and responsibilities for students with children and dependents, including lactation accommodations, child care, information and resources for students who are parents, financial aid, and health care,” Hsu and Pires said. SF-WAG intends to present a “special report and set of recommendations” to Patricia Gumport M.A. ’82 ’86 Ph.D. ’87, the vice provost for graduate education, during winter quarter of the coming school year. In Cheuk’s view, more transparent data on student-parents at Stanford could help the University address concerns. Currently, neither the SPA nor the University have a precise number for students at Stanford with children, making it difficult to allocate appropriate resources to a population of unknown size. SF-WAG calls “strategies for accessing and collecting student family data” one of its immediate priorities. Gathering parental status poses particular challenges. Unlike other demographics such gender and ethnicity, which tend to be static variables, parental status can change at any point during a student’s time in college. Furthermore, Cheuk said, student-parents may not be forthcoming about having children out of worry for how peers perceive them. “If you don’t count us and the data isn’t tracked, nothing will be done,” Cheuk said. For parents like Cheuk, organizing meetings — she and Peterson report attending over 60 between the two of them since 2014 — in addition to pursuing their degrees and taking care of their children is worthwhile if it creates change for future parents like Hummel. Cheuk envisions eventually funding a graduate student family center to serve as a comprehensive resource for student-parents. Other universities such as the University of Pennsylvania, the University of Chicago and UC Berkeley have similar centers. Cheuk likely won’t see this plan executed during her time at Stanford, but she has begun drafting a long-term proposal for its implementation. Contact Neel Ramachandran at neelr ‘at’ stanford.edu. An earlier version of this article incorrectly stated CCSC’s tuition rate, describing it as weekly rather than monthly. The child care center charged between $1,850 and $2,445 per month for its most extensive care the last academic year. The Daily regrets this error.